Terry Matthews tells in video testimonial how he helped his friend gain employment with techniques he learned from Dr. and Master Zhi Gang Sha at a recent event. Dr. Sha will be in Sedona, AZ for upcoming Tao Retreat. “I said to my friend that I just received a really potent healing tool from Master Sha." says Terry Matthews of Pheonix, AZ. New personal video testimony shows Terry Matthew’s story about how he helped a friend who was unemployed for over a year clear her employment blockages with high level healing energies infused in the Ling Guang (Soul Light) Calligraphy created by Dr. and Master Zhi Gang Sha. In this video testimonial, Terry tells how his friend contacted him about her unemployment. Terry used the Ling Guang (Soul Light) Calligraphy created by Master Sha to meditate with his friend and asked for employment blessings. “I said to my friend that I just received a really potent healing tool from Master Sha. Let’s see if we can move some blockages preventing you from getting employment,” Terry says. “So I went to see her with the calligraphy, we put it up against the wall and we chanted the name of calligraphy, which is Shining Soul Light for half an hour. At the end of the healing blessing my friend and I were in an incredibly deep relaxed space. She left and 3 days later she called to say that interviews were flooding in.” Terry adds that about 2 weeks later she had been offered the job she really wanted. “This is someone who had been looking for a job for a year. A half an hour of receiving the healing blessing with this calligraphy totally changed her path. Whatever blockages were there had gone. It’s a testimony to the power of these calligraphies.” To watch Terry Matthew’s personal video testimonial, go to: https://www.youtube.com/watch?v=fzzz4PI23BQ. An international bestselling author, Master Sha is author of ten books in the Soul Power Series published by Simon & Schuster (Atria Imprint), with each book reaching the New York Times bestselling list and four of them reaching #1. Master Sha’s Soul Healing Miracles book published in 2013 by BenBella was instant bestseller on USA Today and Wall Street Journal. 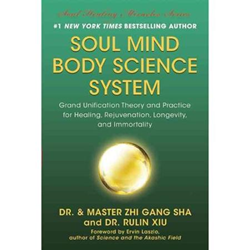 His newest book, Soul Mind Body Science System will be launched in Arizona during the Tao Retreats in November, 2014. The Soul Healing Miracles™ Chanting Channel fosters a soul healing community to learn and use chanting and soul songs for personal, spiritual, mental and soul development, 24/7. For more information, visit http://www.DrSha.com.